Chocowinity Chicken Sanctuary and Education Center, Inc.
We are a 501(c)(3) nonprofit organization, located in eastern North Carolina, providing permanent sanctuary to abandoned chickens or poultry in need of a home for some other reason. We offer information on chicken care to individuals and strive to educate the public about the effects of factory farming on the animals, the environment, and human health. We began, unofficially, in 1996 when the founder discovered a chicken on the highway in front of a large slaughterhouse. Lucky Pearl was our first experience with the sad plight of commercial broiler chickens. He was with us less than six months when he died of heart failure. Since that time, we have taken chickens from abuse cases, cockfighting raids, overturned transport trucks, illness or death of owner, laboratories, and abandonment in both the commercial broiler and egg industries. We are extremely grateful to our friends and supporters, including our veterinarian, Dr. Christy Barndt, of Chocowinity Veterinary Hospital. We regret to announce that the sanctuary is at full capacity for roosters and we cannot accept any roosters at this time. We will still provide advice and suggestions on how to cope with rooster problems and offer other placement suggestions. So please do not hesitate to call us about a rooster, but please be aware that we cannot physically adopt him. THIS DOES NOT APPLY TO BROILERS. If you want a rooster, PLEASE let us know, as we receive calls weekly from people looking for homes for unwanted roosters. 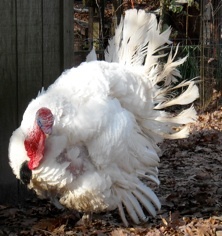 Remembering Timmy at Thanksgiving...and in memory of the 45 million turkeys killed for the holiday this year.